On this first trip of the day we quickly found a whale east of the shipping lane. The whale moved towards Treasure Island, diving in 20-30 feet of water. I didn’t take any photos on this trip, but SFWT photographer Joey did. Check out his flickr. On this trip we located a whale between Alcatraz and Angel Island. On our first sighting the whale came up within 50 yards of the boat. 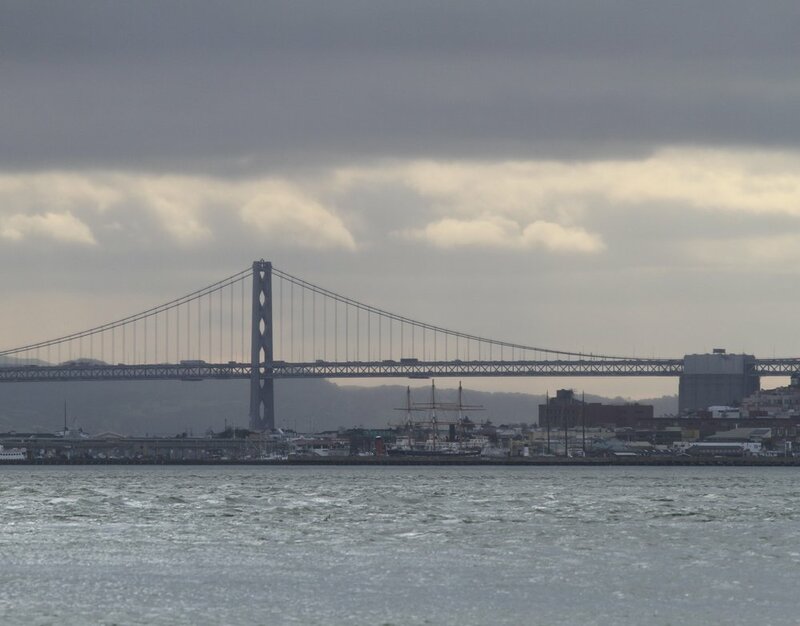 After our first sighting, the whale surfaced every 10-12 minutes and appeared to be going back and forth between Alcatraz and the north tower of the Golden Gate Bridge. 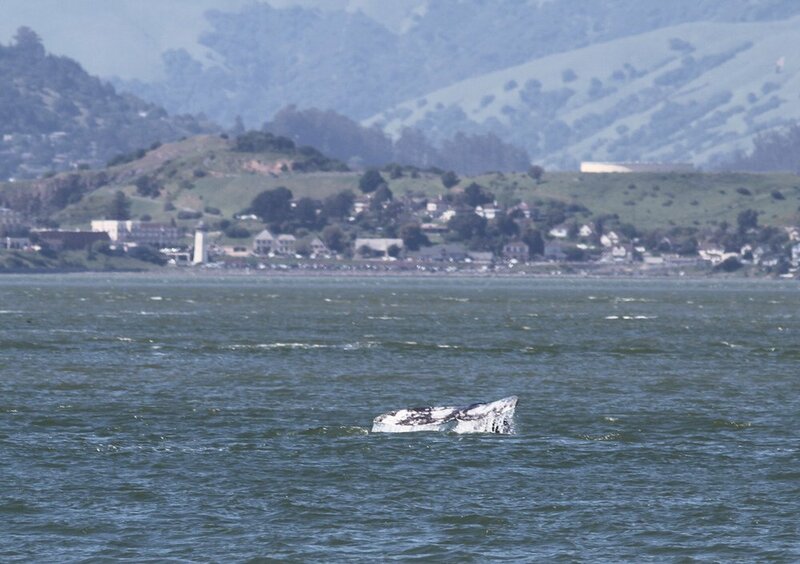 For our final trip we found a whale on the east side of Angel Island. This whale stayed in roughly the same location for the whole trip and surfaced regularly at 5-7 minute intervals. We saw a couple of fluke dives from this animal. 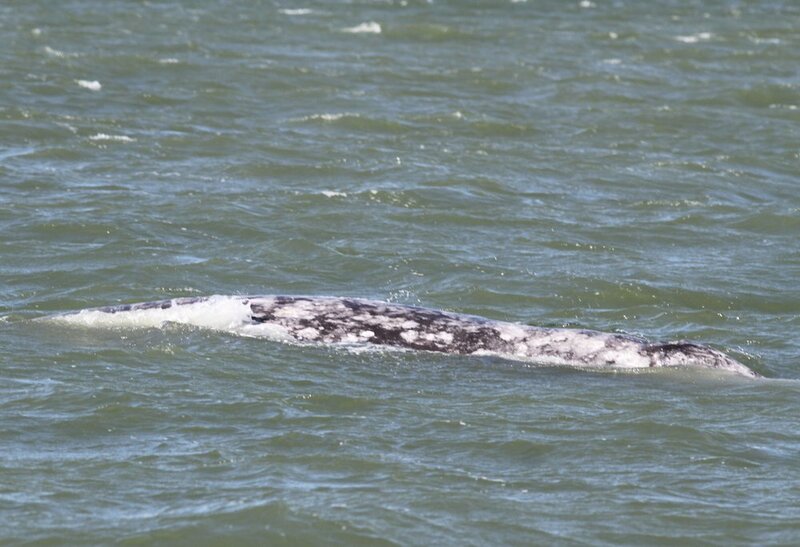 On this trip we were able to find a gray whale surfacing on the northeast side of Angel Island. The whale popped up regularly every seven minutes. It began to move towards Angel Island. Eventually the whale moved towards Tiburon before heading back out towards the east shipping lane. On our first trip of the day we spotted the gray whale near Southampton light. The whale was spouting every ten minutes and kept its distance from us. 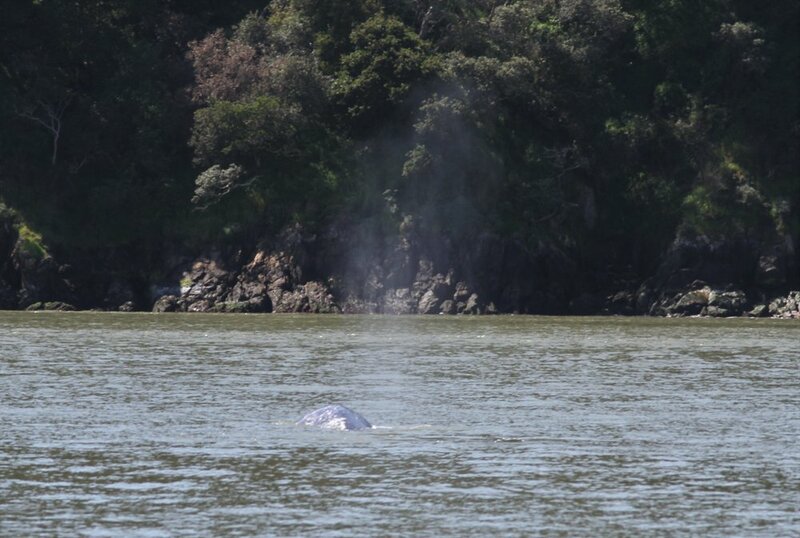 On this this trip we found a gray whale close to Angel Island near the shipping lane. Bill Keener from Golden Gate Cetacean Research was on vessel Oscar Tango observing the gray whale. 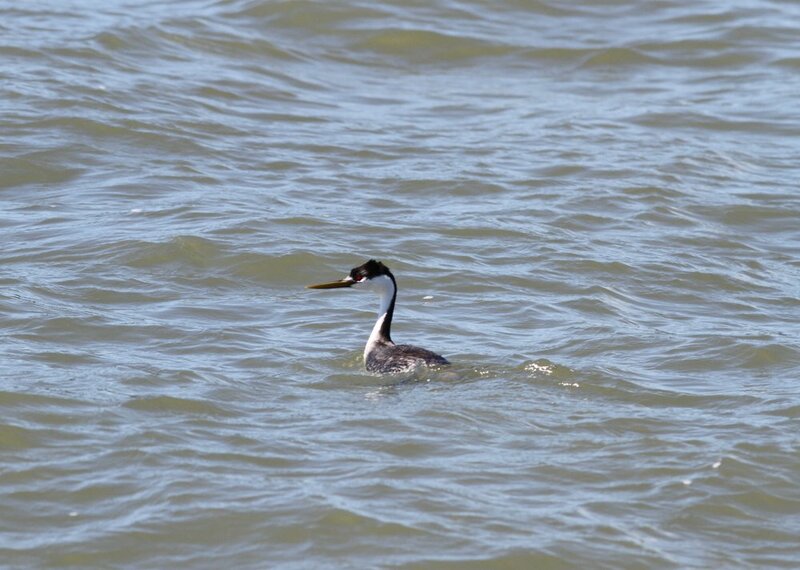 The whale swam close to shore and seemed to be swimming against the current, moving towards Raccoon Strait. On this trip we had a hard time locating a whale. Near the end of the trip we were floating on the east side of Angel Island, searching for whales, when a gray whale popped up 50 yards off our bow and gave us a good look. 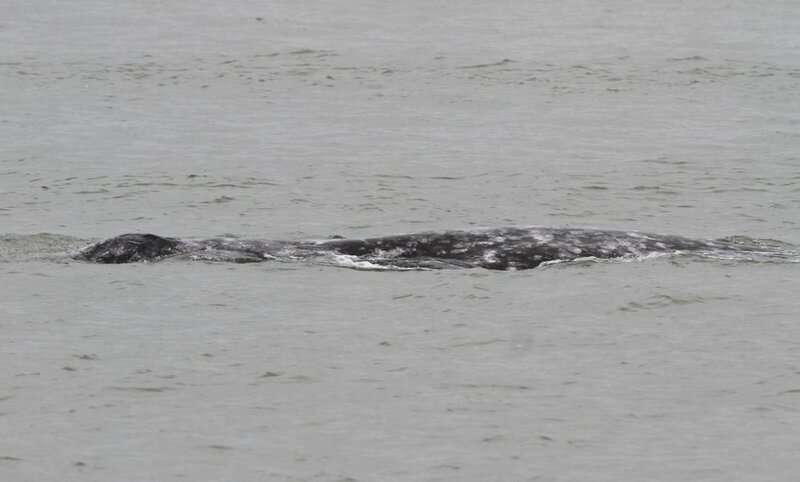 On this trip we found a gray whale near Southampton light. After viewing the whale, we headed towards the Golden Gate Bridge. 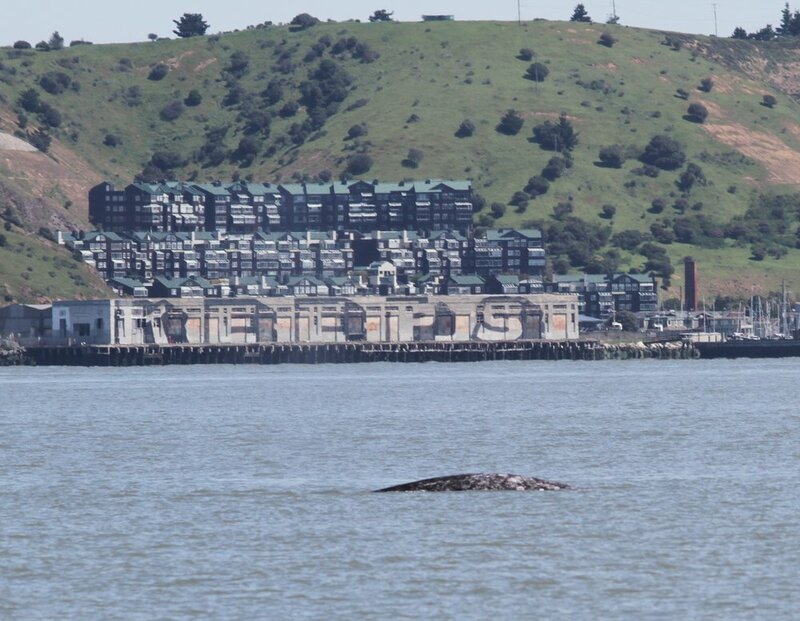 For our second trip, we found a gray whale between Alcatraz and Angel Island. Although the whale kept its distance for the most part, it did approach the boat within 100 yards. On our final trip of the day we had reports of a whale just outside our harbor. We found a gray whale close to the Bay Bridge. Over the course of the trip the whale moved towards the waters between Alcatraz and Angel Island. On this trip we headed towards the Golden Gate Bridge first, where we spotted harbor porpoises and harbor seals. 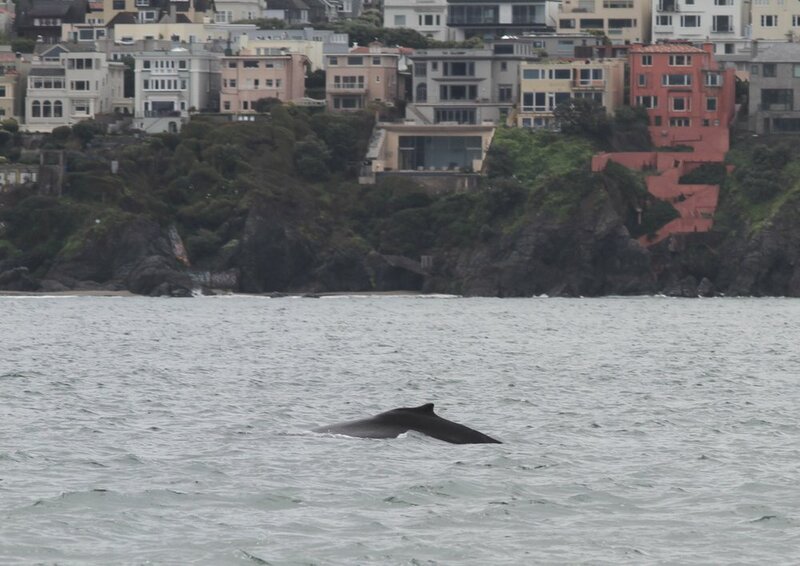 From there we moved towards Sausalito, where we found a gray whale. The gray whale was spouting regularly and showing it’s back, but we did not see any fluke dives. At one point the whale came within 50 yards of our boat. On this trip we headed back to the whale near Sausalito. The same gray whale was still near the harbor, spouting every ten minutes. We also saw harbor porpoises and harbor seals. This trip started off with a lot of rain, but as soon as we left the pier the weather started improving. We headed west towards the Golden Gate Strait. We had just passed the Golden Gate Bridge when our first whale was spotted. It was one of two humpbacks feeding on anchovies in the strait. 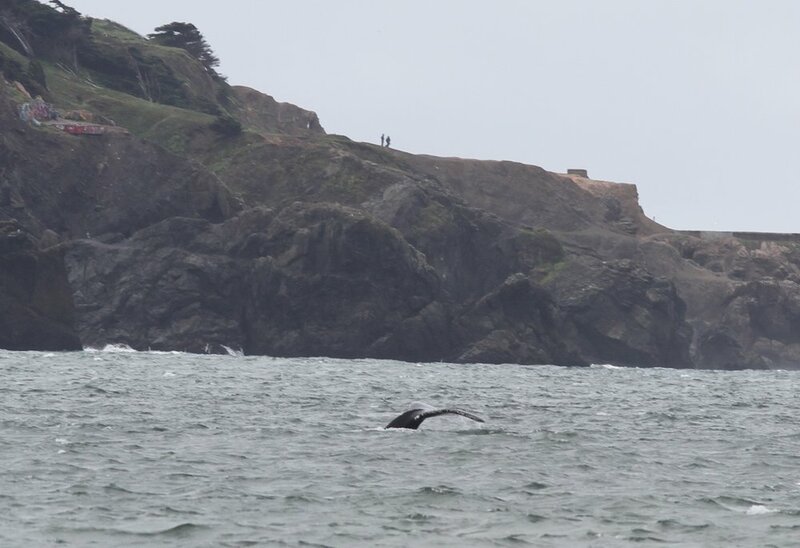 One of the whales stayed near Point Bonita, while the other made its way southeast towards Baker Beach. While we were watching the closer animal, the farther humpback started slapping its tail over and over again. We moved out of the way to let a large ship pass us. 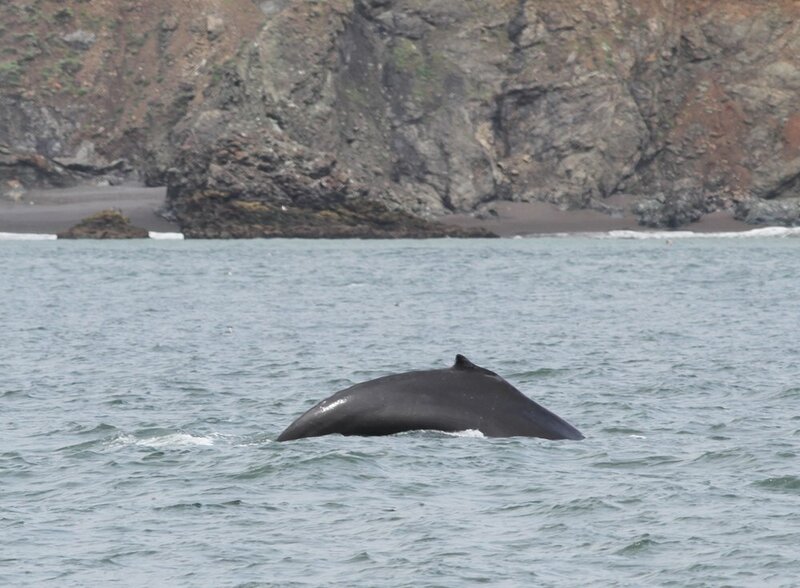 When it had passed, both whales were near Point Bonita. We reapproached and eventually had a whale on either side of us. 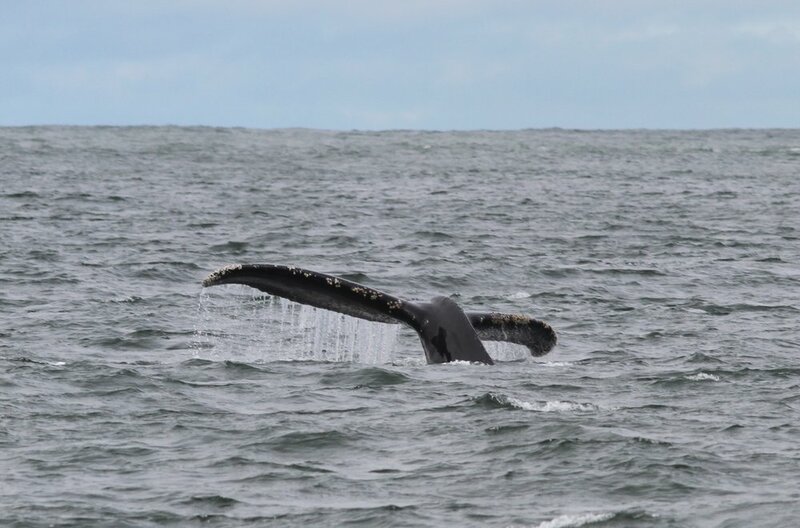 These were the first humpbacks to officially enter the Strait for the season - nearly three weeks ahead of schedule! On our first trip of the day, we initially headed to the Golden Gate Bridge. 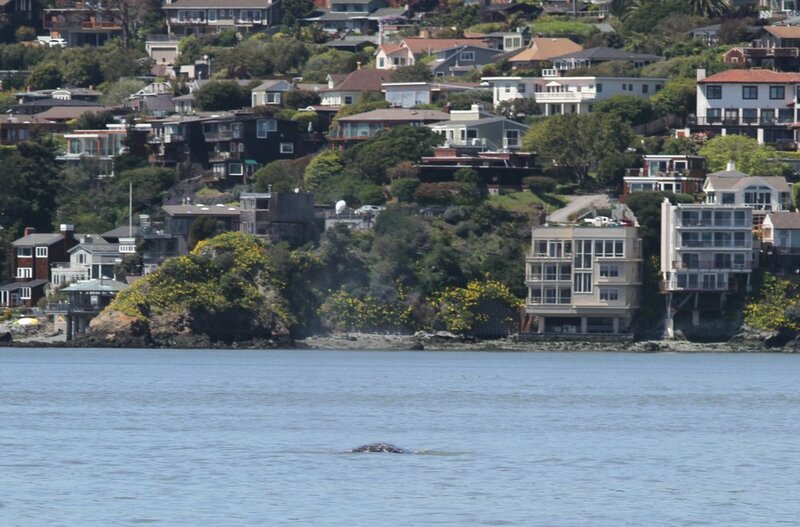 Eventually we received information that a whale had been spotted in Richardson Bay. We approached and found a gray whale near a paddle boarder and a kayaker. We sat in neutral and the gray whale circled around us, coming within 50 yards of the boat. There was algae typically found on the sea floor floating on the surface of the water, which may have indicated the whale had been stirring up the mud at the bottom looking for food. We saw one fluke dive from this animal. 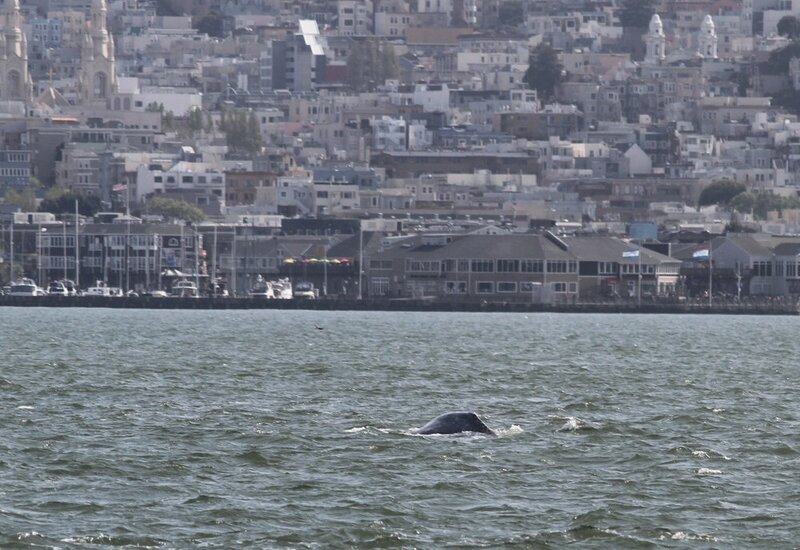 We stayed with this whale until it moved towards Tiburon, then headed to Fort Mason, where we found another gray whale. On this trip, my sister Helen was sailing in a regatta. We passed her when she was in first place! Go Helen! Near the regatta was a harbor seal mother and pup and some interesting birds, including common loons and pigeon guillemots. 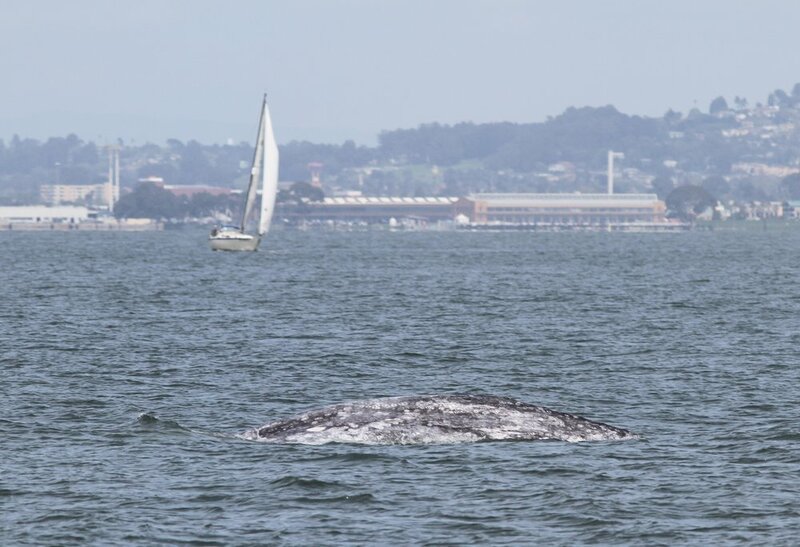 On our next trip, we headed out past the bridge and towards Sausalito, where we had left a gray whale on our previous trip. Near the north tower of the Golden Gate Bridge we saw a Steller’s sea lion - a relatively rare sight in San Francisco Bay. We searched for the whale in Richardson Bay and covered most of the bay looking for spouts, but we weren’t able to find any whales on this trip. Since we hadn’t located whales on our previous trip, for the final trip of the day we decided to head out into the Pacific Ocean to search for our whales. After a few minutes of searching just outside the Golden Gate Strait, the captain spotted a spout. 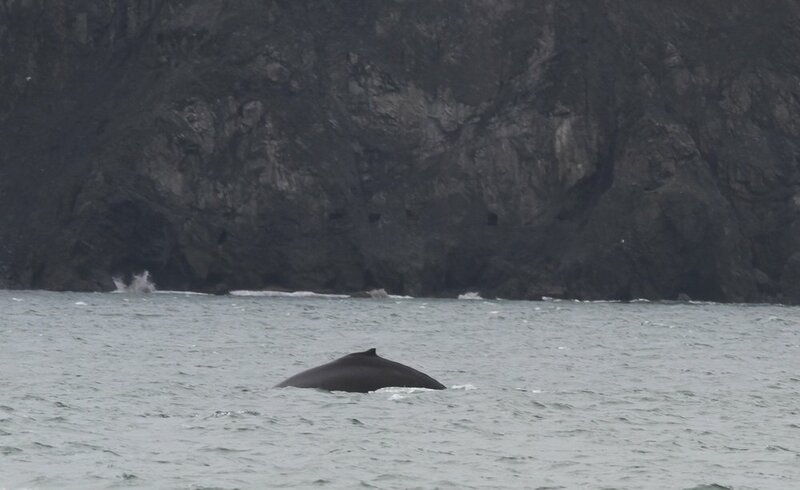 It was the first humpback of the season! The humpback was keeping its distance from us, but appeared to be feeding. There were lots of birds gathered around the whale. The animal moved around a lot, overall heading north. It did not show us any flukes. The whale did not pass the demarcation line to enter the Golden Gate Strait, but it came close. A few large ships passed by us while we observed the whale. On this trip we headed west past Fort Mason, around to the central bay, and then back around Angel Island, stopping near Southampton light. This is where we saw our whale. We had a gray whale surfacing in the north shipping channel. A few large ships passed by us as we watched the animal. 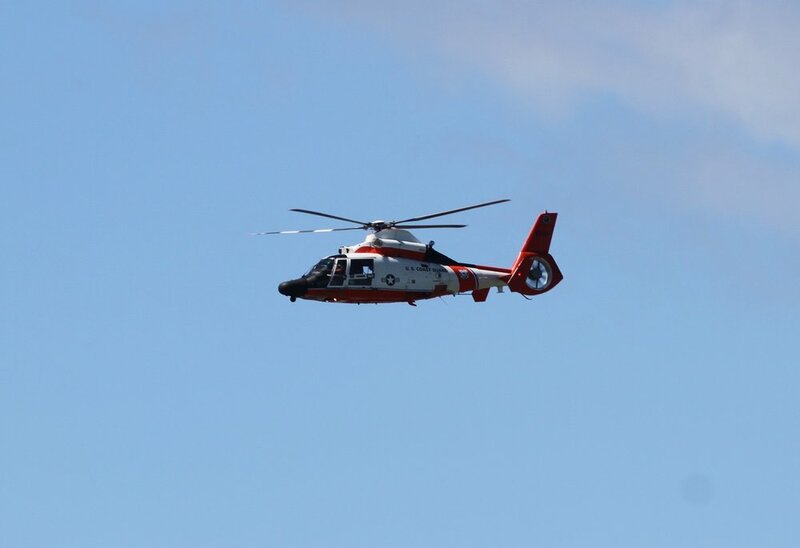 The sighting was reported to Vessel Traffic and the ships alerted to the presence of the whale. On this trip we headed east towards the Bay Bridge and found one whale near Treasure Island. Strong winds and currents kept us farther from the animal, who was surfacing infrequently. 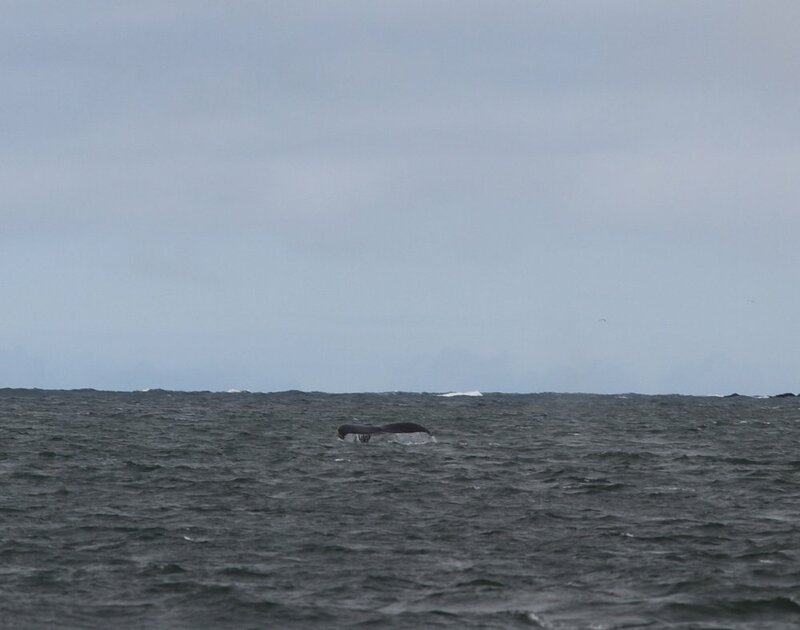 As we started to make our way farther north, we spotted a second whale who showed us much more of their body. We continued towards Southampton shoal light, where ferry boats had reported another whale. We located it and were able to view the spout and body. 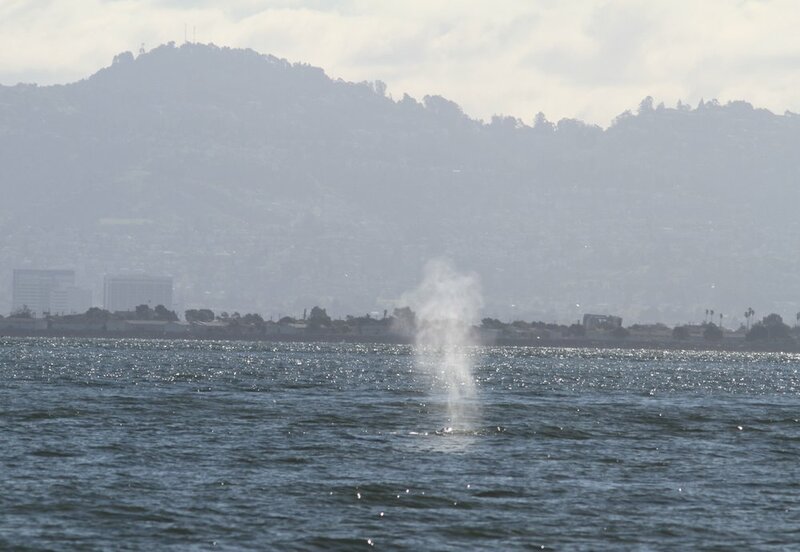 There was another whale far in the distance close to Tiburon. All the whales we saw were gray whales.